At an Otesaga Hotel wedding, the fall weather was up and down. Broken clouds streamed over the Otsego lake wedding ceremony. Laura and Brad stood under the chuppah for their jewish wedding ceremony. 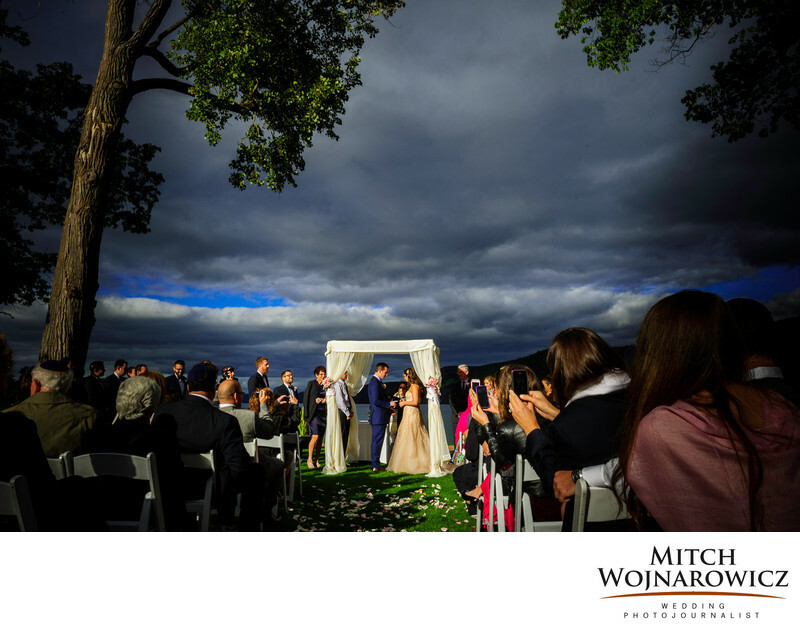 And as they were saying their vows, the sun broke through and beautiful late day summer light streamed across the great lawn and out to the point on the hotel grounds, illuminating the couple as they solidified their bond. As a Cooperstown wedding photographer, I enjoy working anywhere in the area, from a Farmers museum wedding to an Otsego lake wedding to a wedding at any other Cooperstown wedding venues. I’ve even photographed a Baseball Hall of Fame wedding. If you’re looking for a photojournalistic wedding photographer for your Cooperstown wedding, please get in touch with me today. I’d love to talk with you about working with you for your Cooperstown wedding ceremony or reception anywhere. Keywords: albany (45), cooperstown (9), otesaga (9).